Ald. Patrick O'Connor, with Shriver Center President John Bouman to his right, prepares for Monday's hearing on the minimum wage. CITY HALL — The City Council's three separate proposals to raise the minimum wage drew backers and detractors to a committee hearing Monday. Business interests generally opposed the hike or insisted that the state set the minimum wage, while many aldermen expressed sympathy for workers employed full time, but struggling to stay above the poverty line. The hearing produced no actual action, and was recessed at the end of the day given the number of people who showed up to testify in the packed gallery. The hearing will be continued at a later date. Tanya Triche, spokeswoman for the Illinois Retail Merchants Association, said any such hike would be "well-intentioned but wrong for the city." She said most minimum-wage jobs were never intended to sustain a family. Yet Ald. Joe Moreno (1st) lashed back that "they've become that for so many families" and "that's reality." He advocated a city increase to $15 an hour. Ald. Patrick O'Connor (40th), chairman of the Committee on Workforce Development, which held Monday's hearing, pointed out the City Council is weighing three separate proposals. Allowing for other variations in implementation and other details, he said one would raise the minimum wage to $10 an hour, another to $13 and another to $15. Ald. 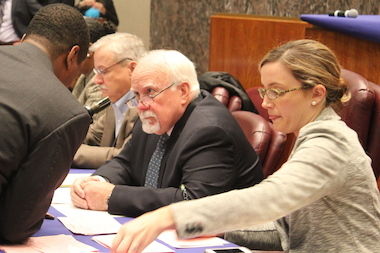 Will Burns (4th), co-chairman of the Working Group assigned by Mayor Rahm Emanuel to tackle the issue, said it had voted 14-3 to back a $13 minimum wage phased in over four years. He called it "a balanced approach ... without hurting small businesses." Working Group co-chairman John Bouman, president of the Sargent Shriver National Center on Poverty, said it was meant to address that "the trend is increasing income inequality." The mayor also has lined up behind the $13 minimum wage. Ald. Ameya Pawar (47th) said he supported the $13 compromise, but only if combined with reforms like paid sick leave, a more progressive state income tax and extending the earned-income tax credit to single fathers, as specified in the group's formal report. "The deck is still stacked against everyday people," Pawar said. Elise Houren, spokeswoman for the Chicagoland Chamber of Commerce, joined Triche in saying her organization opposed any increase in the minimum wage, in the city or statewide. Houren said it would put city or state businesses at a "competitive disadvantage" and have a "chilling effect on business investment." "We believe that wages should be set by the market," Triche added. Yet Sam Toia, president of the Illinois Restaurant Association, separated from them by supporting what he called "a reasonable increase of the minimum wage" to $10.65. "The minimum wage is a floor, not a ceiling," he said, citing Shriver Center figures that the minimum wage reached maximum buying power in 1968, and that minimum wage would translate to $10.71 now. Ald. John Arena (45th) countered that former U.S. labor secretary Robert Reich has put that translated figure at $15. Addressing business attitudes that the wage should wait for the market to raise it naturally, he said, "Not now just doesn't float," adding, "If not now, when?" "We need an agenda for shared prosperity," said Caroline Gibbons, of Chicago Women Take Action, in advocating for the $15 minimum wage. Joined by Jane Ramsey, president of Just Ventures, they argued the minimum wage and tip wages largely affect women and single mothers.